Border Crossings: Immigration advice for those attempting to cross borders, is a pamphlet of poetry as advice. Border Crossings advises potential immigrants using many forms of erasure poetry - and all that the form implies through omission and inclusion. The erasure poems in this collection use white-out and black-out along with algorithms such as The Deletionist to create new stories. Through erasure poetry Border Crossings asks questions about our how we define ourselves, raising issues about our tenuous understandings of nationality, borders and the circumstances of migration. These are poems both created and found. Revealing and concealing. Natalie D-Napoleon is a writer, singer-songwriter and educator from Fremantle, Australia who now lives in California. Currently, she works as a Coordinator at a city college Writing Center. She has had creative non-fiction and poetry published in Meanjin, Entropy, The Manifest-Station, Australian Poetry Journal, Westerly and Writer's Digest. She is a two-time finalist for the Penelope Niven Creative Nonfiction Award at the 2018 and 2017 International Literary Awards. 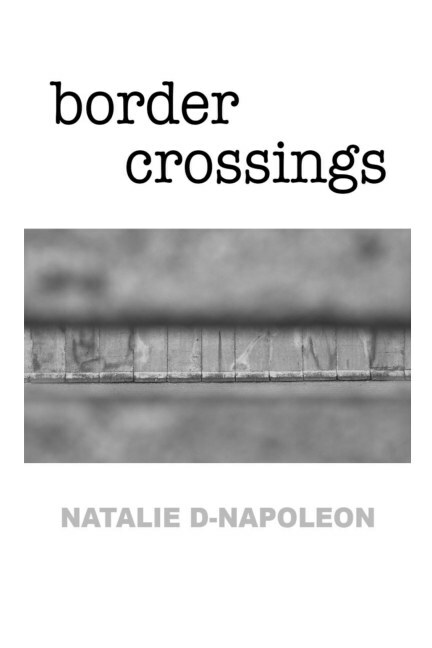 In 2018 "Border Crossings" was a finalist in the Laurel Review Midwest Chapbook Competition. Poems from this collection have been published on Poetry WTF? !, Australian Poetry Journal, The Laurel Review and Poets Facing the Wall, an anthology. Her poem “First Blood: A Sestina” recently won the prestigious Bruce Dawe Poetry Prize through the University of Southern Queensland, Australia.